On a field in Brookland just off Fourth Street NE where priests used to play soccer, Gail Taylor harvests an ear of Bear Island Flint corn and peels back a husk to find a worm nibbling at the pomegranate-red kernels. Without hesitating, she executes the pest with the quick slice of a knife and reaches for the next ear. The two-acre plot, with its urban soundtrack of cicadas, cars and church bells, is Taylor’s farm, courtesy of the Catholic order housed there, which lets her work the land for free. Since 2012, the 36-year-old ex-policy activist has been using the skills she learned from five years on an organic farm in Maryland to grow crops such as eggplants and tomatoes. She would like to be able to sell her fresh, locally grown produce to neighborhood residents, but doing so would trigger a dramatic hike in the tax assessment for the property. Likely, the nonprofit Missionary Oblates of Mary Immaculate would be forced to end the noncommercial contract that allows Taylor to use the land. Taylor has turned her frustration into action, and with the help of American University’s law clinic and council member David Grosso (I-At Large) has drafted a bill to change the city tax regulations that make it difficult for urban farmers to create economically viable businesses. The city has a number of vacant lots that urban agriculture proponents say could be put to use growing food. But the District encourages development by taxing vacant and blighted land at higher rates, providing little incentive for private land-owners and aspiring farmers to strike leasing deals. Nonprofit groups, such as religious groups, risk losing tax exemptions if they lease their land for commercial purposes. Echoing similar initiatives in cities such as San Francisco and Baltimore, the D.C. Urban Farming and Food Security Act would change that. The bill outlines a plan to connect publicly and privately owned vacant land with urban farming ventures in an effort to provide more sustainable and healthy food options for surrounding communities and to transform unused and sometimes unsafe areas into productive green spaces. Introduced in February, the bill offers private owners a substantial property tax deduction — 50 percent — if they lease the land for farming. Supporters said they hope to see the bill extend tax-exempt status for commercial urban farms on land owned by nonprofit groups and religious entities. The bill also encourages the farms to donate to District food banks or shelters by creating a “farm to food donations” tax credit. “We have a ton of room,” said Grosso, who introduced the bill with Mary M. Cheh (D-Ward 3) and Tommy Wells (D-Ward 6). The bill has gained substantial support in the council with Chairman Phil Mendelson (D), Kenyan R. McDuffie (D-Ward 5) and mayoral candidate Muriel Bowser (D-Ward 4) joining as co-sponsors. At a public hearing in June, the city’s Department of General Services, which is responsible for city land, identified 16 public lots that could be used for urban agriculture. Many vacant lots are located in the same communities that could benefit the most from access to fresh food. Taylor conceived the idea for the bill after running into obstacles trying to find land for her farm a few years ago. She consulted with the free law clinic at American University to research and help draft the legislation, eventually seeking out Grosso because she knew he had worked on his parents’ organic farm in Loudoun County, Va.
For the Brookland plot, Taylor cannot make any commercial transaction without triggering an estimated $50,000 property tax hike for the owners. She donates nearly all of the harvest to local charities and to volunteers who work on the farm. She funds the seeds, compost, tools and equipment with a combination of donations and her savings.She also works part-time at a yoga studio. The Urban Farming Act stipulates that the leases must be for a minimum of three years so farmers have enough time to make their investment profitable. The bill doesn’t address what would happen if a developer purchased the lot after a farm becomes established in a community. A provision also requires applicants for vacant city land to have at least one year of farming experience and to be a District resident for at least one year. The fiscal impact of the bill on the city has not been estimated, Grosso said, but the council has budgeted money to create a new food policy director. Baltimore piloted a program in 2011 that leased vacant public lots to two farms and has almost completed the process for a third. It is also considering a tax incentive to entice private landholders to follow suit. The new farms have rapidly established themselves, Beth Strommen, the director of Baltimore’s office of sustainability, said in an e-mail. The District bill is one of the first municipal acts in the country to be released on an online platform for the public to comment on and annotate legislation. The OpenGov Foundation, a District-based nonprofit group trying to bring public engagement online, worked with Grosso to release the act on its ­MadisonDC site. Grosso added comments from the site, some suggesting vacant land be made available as community gardens, to the official record at the public hearing. Lawmakers could also consider making a new tax rate specifically for urban agriculture and support zoning that would allow industrial spaces to be used for hydroponics and vertical farming, said Lillie Rosen, food access director of nonprofit group DC Greens. 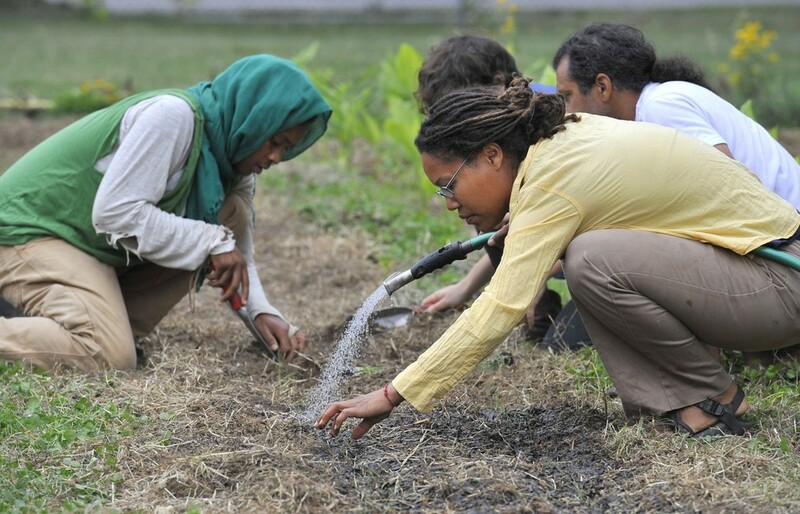 “Urban agriculture is already starting to be part of the urban development in D.C. This helps us be able to actualize it,” Rosen said. As she uproots weeds, wearing old jeans and her less expensive, dark-framed “farming glasses,” Taylor says she remains as driven to produce fresh food for the city she loves as the day she started. From weeding borage patches to transplanting “dinosaur” kale to tasting the freshest local produce, Councilmember Grosso’s Farm Tour this month was a success. Councilmember Grosso and Team Grosso transplanting "dinosaur" kale at the Farm at Walker Jones in NW Washington, D.C. The Farm Tour was initiated after Grosso introduced the D.C. Urban Farming and Food Security Act of 2014. This legislation would establish an urban farming land leasing initiative, a nonrefundable tax credit for food commodity donations made to a District food bank or shelter, and real property tax abatement for unimproved real property. As part of putting his sweat where his legislation is, David toured the UDC CAUSES Muirkirk Research Farm, the Millennial Farms at J.O. Wilson Elementary School site, and the Washington Youth Garden at the U.S. Arboretum. He and staff also volunteered at the Farm at Walker Jones. At the Muirkirk Research Farm, run by the UDC College of Agriculture, Urban Sustainability, and Environmental Science, Councilmember Grosso met with Dean Sabine O’Hara to tour the farming facility located in Beltsville, MD. Vegetables grown hydroponically in mobile greenhouses and intricate aquaponics systems that contribute to raising both tilapia and produce are just two examples of how the site is promoting urban farming, sustainable living and environmental education in the District. It was also exciting to learn about their ethnic and specialty crops that cater to our city’s many immigrant communities. Touring the Muirkirk Research Farm in Beltsville, Maryland. Millennial Farms uses simple, cost effective, vertical farming methods to promote new jobs based around local farming economies. Claire Newbegin and Niraj Ray met with David to show him their work to de-industrialize the food system and contribute to local urban farming initiatives. At the Washington Youth Garden, Grosso discussed not only the garden, but food education for D.C. youth as well. The garden teaches students and community members about soil, pollination, food systems and more through hands-on garden visits and installing gardens at local schools. Mid-week Team Grosso spent all morning volunteering at the Farm at Walker Jones, located at the corner of New Jersey and K NW. The farm, run by local non-profit D.C. Greens, not only serves as a school garden for the Walker Jones Education Campus, but cultivates and sells fresh produce at a reduced price for neighborhood residents, and is as a base of operations for D.C. Greens’ work with school gardens and educational programs throughout the city. Team Grosso helped transplant seedlings, stake tomatoes, weed plant beds, and harvest produce. As the summer winds down and we enjoy the bounty of locally grown foods, it is a perfect time to consider how we can promote urban farming and sustainable living. To that end, Grosso will keep pushing his legislative agenda, including the Urban Agriculture and Food Security Act of 2014, once the Council reconvenes in September. While parts of D.C.—like the H Street corridor, parts of Petworth, the NoMa area, and others—have rapidly developed in the past few years, there are still District-owned lots throughout the city with no current plans for development. Under a bill introduced by Councilmembers David Grosso (I-At Large) and Mary Cheh (D-Ward 3), vacant lots and plots of land owned by the District could be turned into urban farms. The amendment to the Food Production and Urban Gardens Program Act of 1986 would "establish an urban farming land leasing initiative," as well as a tax credit for food donations and tax abatement for properties leased for the purpose of becoming small-scale urban farms. "There's parcels of land in D.C. that, maybe aren't in the right neighborhoods or areas for development yet," Grosso tells DCist. "One of the secrets about development is that it happens when it wants to. It's very hard to create development in a place or location where it's not ready." While Grosso's bill aims to turn these properties into small urban farms, poised to produce locally-grown vegetables and fruits, he says that the vacant lots don't need to remain urban farms forever. "There's a whole field open near 14th Street and Rhode Island Avenue NE," Grosso says. "Someday, development will happen and it will be good and will hopefully require some affordable housing. But in the meantime, we have a lot of land like that that's owned by the District that's just sitting there." At last week's hearing on the bill, Mark Chambers, sustainability manager for the D.C. Department of General Services, said it doesn't address or take into consideration certain environmental issues like testing, cleanup, and—D.C. 's favorite problem—rats. Grosso says that Chambers' concerns are "ill-informed" and that measures to control the rodent population, as well as testing and cleanup, will be addressed once the bill moves forward. There's also the question of what happens when the city decides to develop the land. Removing an urban farm years in the making in a neighborhood community could create a contentious debate like the one at the farm at Walker-Jones. The proposed redevelopment of the McMillan Park Sand Filtration site, which one group wants to see become a farm, is another example. "We just have to be conscious and not be afraid of the public debate," Grosso says. "At some point, it may be a good use permanently, or it may just be a good use temporarily, but it's doing something other than what's happening there now, which is nothing. Put a farm there for a while and see what happens."